Part history, part travelogue, part memoir, Charles Moseley writes a personal account of his journeys across the northern regions of Europe. From Norway to Greenland he describes a haunting world where the voices of the past are never quiet. Charles Moseley was born and brought up in Lancashire. After a varied career, he is still teaching Literature in Cambridge. When not in the throes of this activity, he returns to the village that forms the background to this book, and potters about, He also writes books. I great read at anytime but especially whilst cruising in 'Latitudes North' ! Beautifully written, with personal insight, highly recommended and in ideal Christmas gift! A fascinating insight into the blight of the Arctic. It is a moving and compelling read. Would make perfect Christmas present too! Reveals some of the contents and memories of a well-filled mind in limpid and readable prose. There is so much to learn about his explorations of northern lands where so many myths originated. But all is laced with encounters with the actual. A wonderful book. Very enjoyable and interesting read. Very well written, gave you a feeling of actually being there, and wanting to visit all the places in the book. Beautiful, fascinating and intriguing. Another thought-provoking and erudite read that captures the soul. Wonderful book, full of vivid description and sensitive interpretation of experiences interwoven with history and the marvellous sagas. Latitude North is a splendid example of serendipity, covering a wide and unpredictable range of information and opinions - stimulating and beautifully expressed! Latitude North is an evocative personal history that beautifully captures the spirit of place. Wise, scholarly and moving. 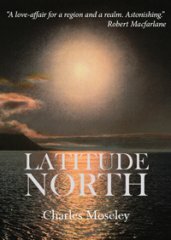 Latitude North is fascinating, richly personal, scholarly and a delightfully enjoyable read. This book is something truly special, an exceptionally emotive memoir. Your writing conveys a vivid sense of atmosphere. I can almost believe I am truly sharing your Latitude North experiences as I read about them! This is one of the most beautifully written books I have ever read. It really is what it says on the cover, part travelogue, part memoire and part history of northern lands and seas. But it is Moseley’s skill in melding all three that makes the whole totally captivating. All is written as if he were talking next to you and anticipating your questions from what he has said. He draws on an impressive knowledge of several disciplines to help you understand what he is experiencing – concerns and delights – and so you feel you are on the journey with him. Such is the effect of this book, I have now planned my first visit to Iceland. Definitely ‘a must read’. So, without any hesitation, here is my vote. A wonderfully evocative account of all things northern, mixing the personal with the historical and the atmospheric. Evocative descriptions and a love of the North fill this fascinating work with atmosphere and emotion. I could see the clarity of the light yet felt the darkness of the history. This is an unforgettable book, worth every moment I spent reading it. This book charts a lifelong fascination with the geographic north, told with affection, rare elegance, and a keen eye for detail. This is a wonderful and richly rewarding read. Marvellous book, fully deserves this vote! A truly wonderful and enthralling memoir. Superb. Moving and emotive. Poetry in prose.